1. In a bowl, using a wooden spoon, mix softened butter and sugar until the mixture gets pale and frothy. 2. Add salt. Stir in the flour in three batches, mixing well after each addition. Form a ball of dough. 3. Flatten the ball of dough. Spread by hand in a 8×8 inch (20×20 cm) square pan to make an even layer. Prick with a fork all over the surface. Place in your refrigerator for 20 minutes. Meanwhile preheat your oven to 370°F (190°C). 4. Bake the pastry for 15 to 20 minutes, until golden but not brown. 5. Place the pan on a rack and let cool completely. Leave oven one and reduce temperature to 340°F (170°C). 6. Combine butter, brown sugar, honey, powdered sugar and cream into a saucepan and bring to a boil. Stir with a wooden spoon until sugar dissolves. 7. When the mixture coats the back of the spoon, remove from heat. 8. Add salt, pecans and vanilla extract. Boil over medium heat for 3 minutes more. The pour filling over the pastry. 9. Bake 15 to 20 minutes, until bubbles begin to form at the center. Remove from oven and transfer on a rack and let cool. 10. Un-mold the cake with the help of the back of a knife blade, running between the crust and the edges. Transfer the cake directly on the wire rack. 11. Once it’s cool, transfer on a cutting board and cut into squares or rectangles. 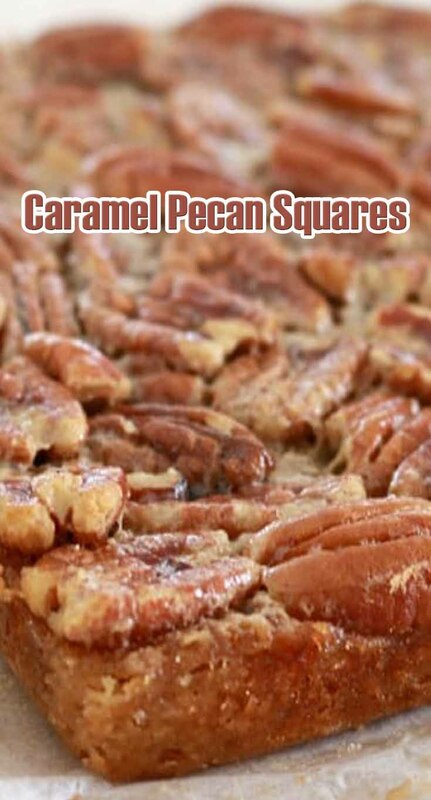 These caramel pecan bars will keep for about 1 week into a air-tight steel box lined with parchment paper.